Neuroangio.org believes that size matters less and less. 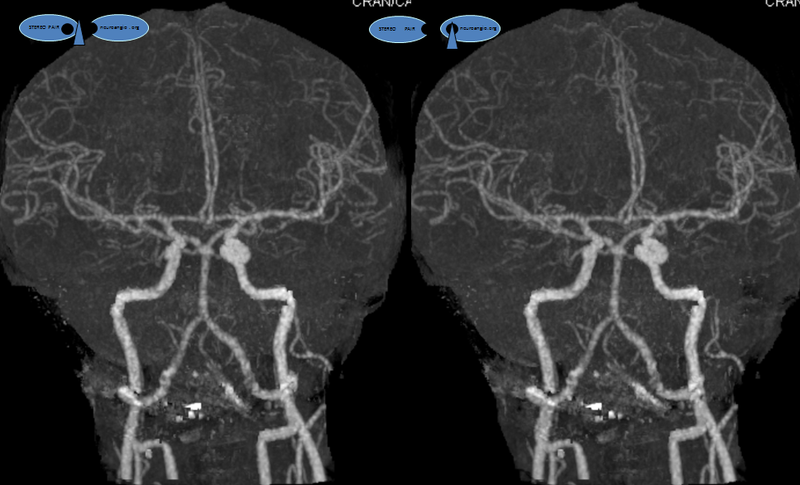 Both giant and tiny blister aneurysms, previously very challenging, with treatments frequently complex and morbid, are now treatable with flow diversion — see Pipeline page and Internal Carotid Artery and Its Aneurysms page. Ruptured blisters are now routinely cured with Pipeline, although this message still needs to be spread. However, coiling technology has also continued to improve, making quiet, slow and overall tremendous progress. Tiny soft coils are now available to attack small aneurysms with increasing safety and efficacy — as long as it is done thoughtfully and carefully. The coil of choice is the smallest one we have — a Target 1×1 helical nano. 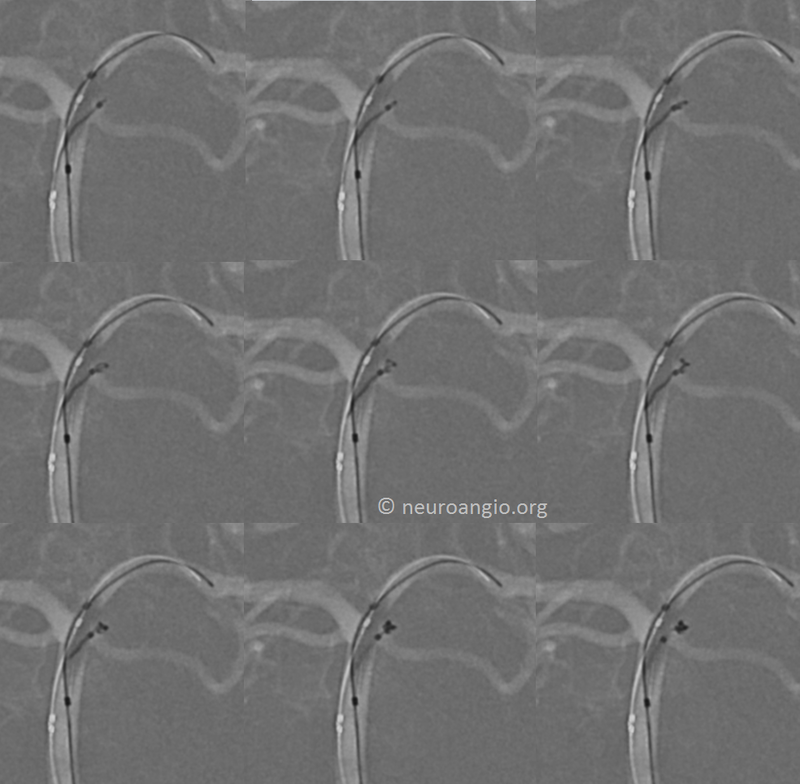 It is critical that the microcatheter stay almost outside of the aneurysm during coiling. 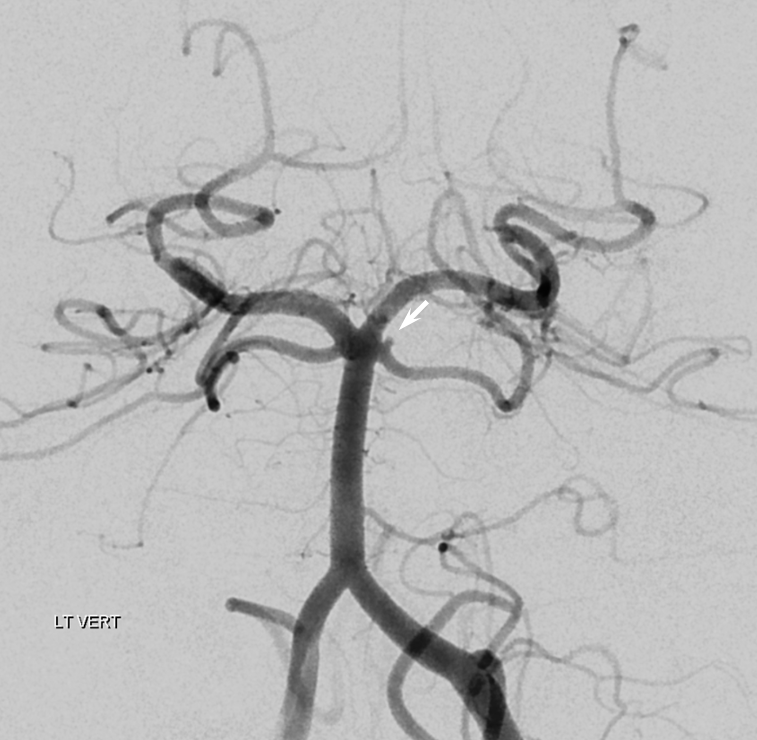 Otherwise, the coil may exert too much pressure on the aneurysm dome. So, as the first loop of coil is slowly delivered into the aneurysm, the microcatheter is slightly withdrawn. 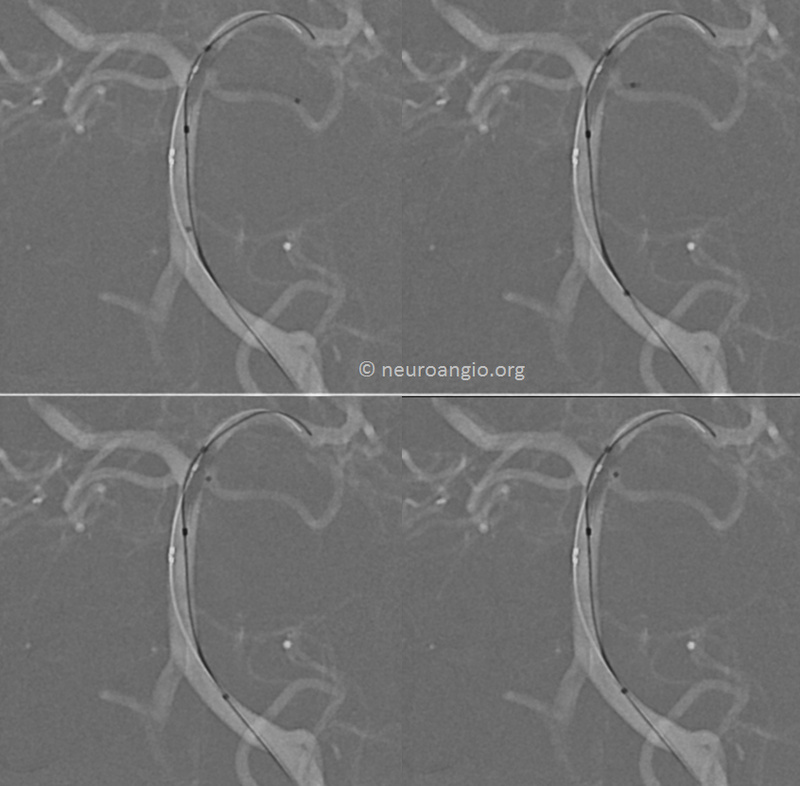 Progressive coil deposition is accompanied by proportional reduction of tension on the microcatheter, so that the aneurysm is almost entirely coiled with the catheter tip just at the neck. The balloon helps keep the catheter deflected towards the aneurysm. A DSA is done before coil is detached. IMPORTANT: This is not a blister aneurysm. A blister aneurysm is simply a hole in an artery, not a saccular aneurysm. Coiling blisters is generally a bad idea. It is basically like putting coils in a hole, instead of an aneurysm dome. 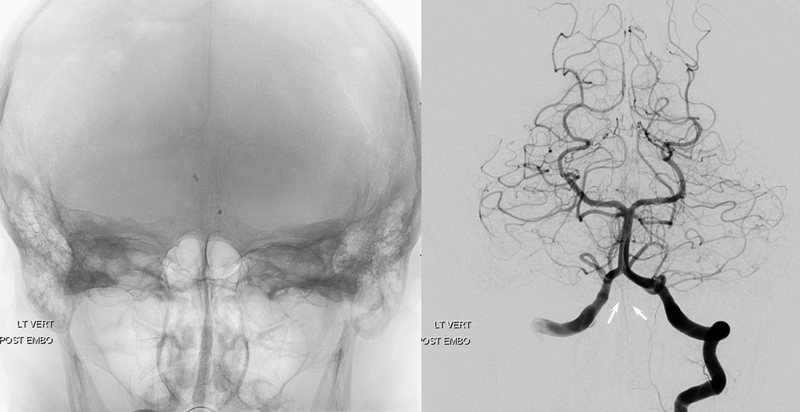 A small ruptured saccular aneurysm and a blister aneurysm may look similar on an angiogram, but they are totally different. How can one tell which is which. Usually, by location. A small aneurysm in a location where we see unruptured saccular aneurysms is likely a small ruptured saccular aneurysm and not a blister. 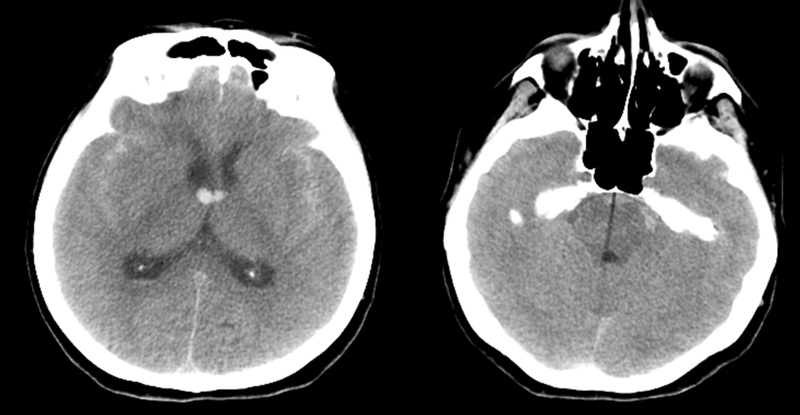 On the other hand, a small ruptured aneurysm in a location where we usually do not see small unruptured saccular aneurysms may be a blister. The classic location of a blister is the dorsal wall of the supraclinoid carotid artery, between the ophthalmic and posterior communicating arteries. Blister aneurysms have historically been treated by parent vessel sacrifice, with or without bypass, due to the extreme hazard and low efficacy of both coiling and clipping. Most recently, blisters have been successfully treated by flow diversion. Given the morbidity or prior treatment approaches, flow diversion is, whenever possible, in my opinion the best method of treating blister aneurysms. 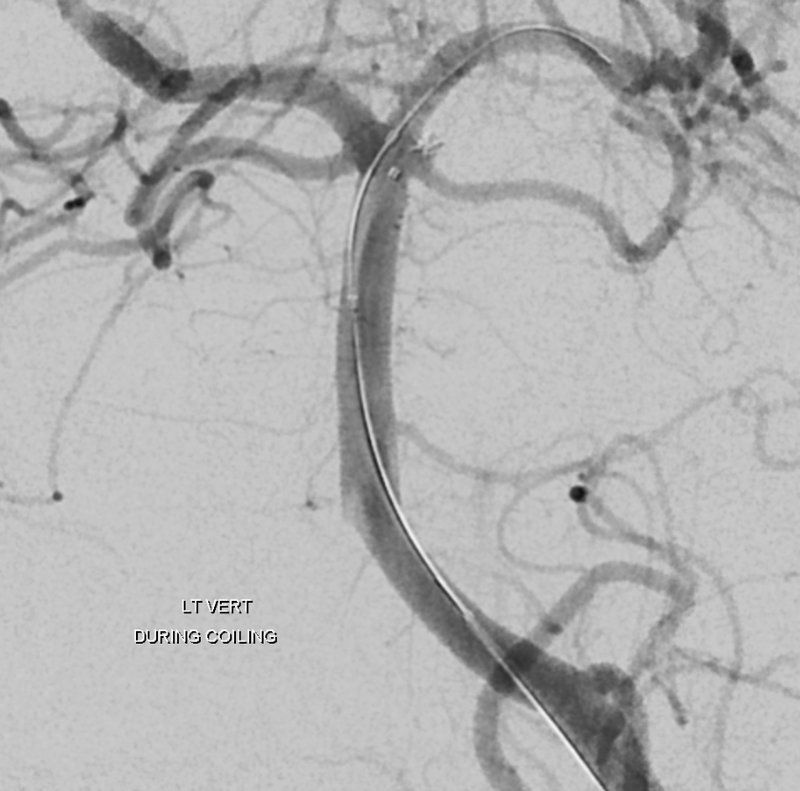 See Blister Aneurysm Pipeline case.